雨傘革命實錄：以史為鏡 Umbrella Revolution: History as Mirror Reflection (IMDb, “Umbrella Reflection” in short) is the most difficult documentary I’ve ever made. Factors like the amount of footage and the total footage made things challenging. The 2014 Umbrella Revolution was a defining period in Hong Kong history and I felt some self-imposed pressure in trying to do a “good” job. I stopped worrying too much by reasoning that Umbrella Revolution will be covered by multiple filmmakers. And my documentary will be one of many films and documentaries covering this period. This understanding has freed me to make my own documentary. 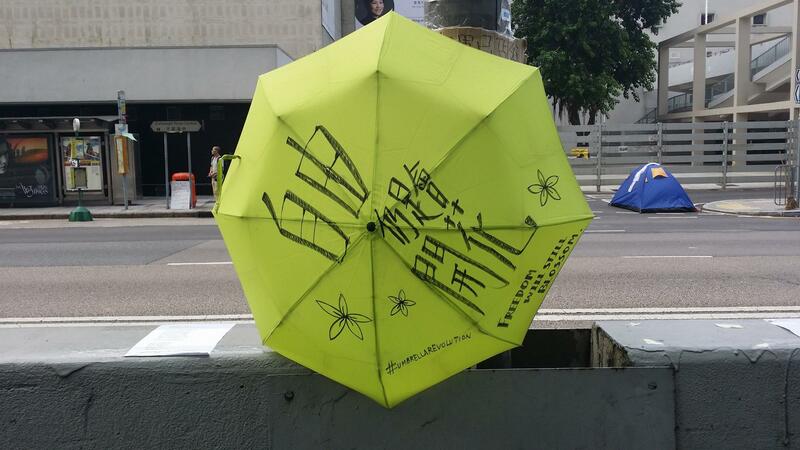 Freeing myself to share my own view of Umbrella Revolution. I feel free to include some big and small moments without feeling forced to include every ‘important’ moments and every “important” participants. Umbrella Reflection is not that kind of movie. I hope people will get a sense of how it feels like to be there after watching Umbrella Reflection. Unlike my first two documentaries which I shot my own footage, I decided to make Umbrella Reflection a crowd-sourced documentary. What I meant by “crowd-sourced” is that Umbrella Reflection relies totally on video footage, photos, songs and artworks shot and created by 100+ creative people (closer to 150+) in Hong Kong. I believe this lack of control of how the raw footage was filmed and who to interview has paradoxically allowed me to paint a more comprehensive picture of Umbrella Revolution. In fact, one of the content creators (an independent citizen reporter who had been arrested more than once) wrote on his Facebook statuses that he was at the wrong places during a few “major” incident” which lead me to think 100+ is better than just one of me. I reached out to the many of the content creators during and after the 79 days of Umbrella Revolution, collecting much more materials than I ended up using in Umbrella Reflection. The multiple people and crowd-sourced approach allowed me to have “eyes” at many places at the same time instead of only me at one place at one time. As a result of contacting many content creators, I’m delighted to have made a few Facebook online friends during the process. The editing of Umbrella Reflection was also mentally challenging. In particular, the scenes of police brutality depicted in the Umbrella Reflection were hard to watch again and again during the editing process. And it is frustrating to know the police brutality still have not yet been dealt with fairly by the judicial system (as of the writing of this director’s statement) despite clear video evidences of the beatings by the eight involved policemen. I’ve tried my best to make Umbrella Reflection good and hope I managed to add some some depth and complexities to it. As the filmmaker, I am still picking up things, small details that I just notice in the film. So hopefully others will have the enjoyment in these discoveries themselves. Finally, I hadn’t imagined a 10-year gap after my debut documentary (“Long Hair Revolution”) in 2005. Life is full of surprise and I am happy to fill this gap by completing two documentaries in 2015.